Congratulations to Stefan Gorka, who successfully defended his Master thesis "Carbon and nitrogen exchange between plant roots, ectomycorrhizal fungi and soil bacteria in the mycorrhizosphere of Fagus sylvatica“ on Thursday 21 December 2017! Excellent, Stefan. Jörg Schnecker has recently received funding for a new project called "SEACUE - Seasonal dynamics of soil microbial carbon sequestration" from the Austrian Science Fund (FWF). The 15th Stable Isotope Network Austria (SINA) Meeting is organized by the Department of Microbiology and Ecosystem Science and the Department of Environmental Geosciences, University of Vienna. Congratulations to Daniel Wasner and David Zezula, who successfully defended their Master thesis on ecological and physiological aspects of the phosphorus cycle on Friday 28 July! Excellent, David & Daniel! A new Horizon 2020 project has been granted to a large European consortium for researching into “Permafrost thaw and the changing Arctic coast”. Andreas Richter will have a key role in Work Package 1 – Terrestrial Permafrost. 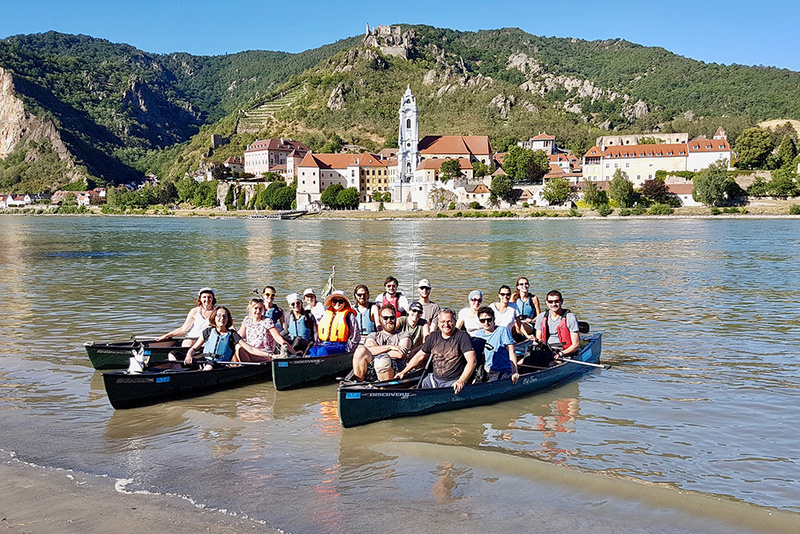 TER discovered the UNESCO World Heritage Site Wachau, a stretch of the Danube valley north of Vienna, by canoe on the hottest days of the year so far. Christina Kaiser has recently received funding for a new project called "SPACE - The spatial aspect of rhizosphere priming" from the Austrian Science Fund (FWF).